Dr. J. Phillip London undoubtedly made tough decisions during his 23-year tenure as CACI International Inc.'s Chief Executive Officer (CEO) -- and his continuing role as Chairman of the Board. During his tenure and afterwards, Dr. London's commitment to moral/ethical leadership and character development is evident in his work. These experiences are key factors in his latest pursuit, which is personally significant, can impact someone's future (positively or negatively), and is a reflection of an individual's beliefs. Dr. London's latest quest addresses the important topic of character and its relationship with success. Dr. London's character development is the result of being raised by good parents who were upright citizens, good people, hardworking, self-reliant, and had strong spiritual perspectives. His father emphasized during his developmental years the importance of this line from William Ernest Henley's poem Invictus: "I am the master of my fate; I am the captain of my soul." This phrase stressed to him the importance of an individual's ownership and control over their destiny. This concept also brought clarity and perspective to the significance of everyone being personally responsible and accountable for their choices -- along with the outcome(s) of their action(s). These strong role models developed his character's foundation, which was further advanced during his time affiliated with the Naval Academy. While at the academy, he learned the importance of time, the idea of mutual respect, commitment, integrity, trust, and being accountable to others to fulfill his duty. Moreover, he believes that an individual's character is a key component of living a purposeful life -- as individuals for the most part want to be proud of the things done and satisfied with the things accomplished. 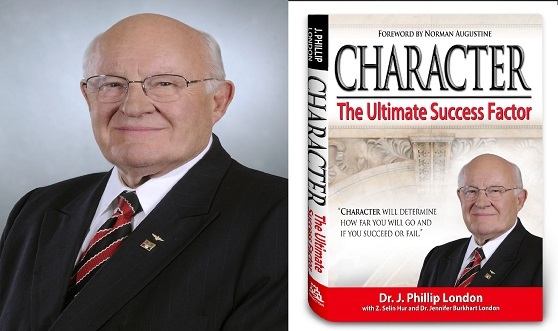 In his latest book Character: The Ultimate Success Factor, Dr. London writes about the subjects of character, ethics, and integrity. This book is the result of his desire to create material about the importance of "doing the right thing" for internal use at CACI. However, as he began to write, he realized that there were increasing societal challenges related to character weaknesses and flaws. This realization drove Dr. London to write a comprehensive book about the role of character in the achievement of success, which isn't solely based on material achievements but also the way the success is achieved. For example, did you: give it your best effort; appreciate those who worked in your environment; do your best with the available opportunities? The answers to these questions reflect a personal philosophy or belief system for individuals to develop their moral and ethical character for humanity's benefit. Dr. London was fortunate to have a few outstanding role models who helped to shape his core beliefs and character. Although, he understands that everyone doesn't have good role models. Notwithstanding, deficits of moral leadership in an individual's life don't abdicate their responsibility to ensure that their actions are ethical, legal, moral, and socially responsible. Anyone who doesn't have a positive role model can read about historical figures (e.g., military leaders, spiritual advisors, or civil rights leaders) to develop their moral framework based on individuals who are known for steadfast character. This process can be used as a moral compass to develop themselves by choosing a respected authority who has similar values that can be used for personal development. I believe in forgiveness, I believe in the notion of character consideration of expressing remorse, of being apologetic and I believe in all these notions. I believe that people have to be able to get up from falling down and proceed on and correct and enhance their lives. Individuals can turnaround character mishaps, but according to Dr. London, "turning things around for an individual takes a recognition that you're on the wrong course." For organizations, there must be a similar realization that turnarounds can begin at any level; although, there needs to be a commitment and desire by organizational leaders to make the necessary change(s). Dr. London recommends that anyone who is in a questionable organization discuss their concerns. By expressing their misgivings, individuals can take a stand to protect their organizations and themselves. Then, if organizational leaders aren't willing to make adjustments (change), then individuals might consider removing themselves from that environment. As stated by Dr. London, there aren't any acceptable times for individuals to compromise on their ethical character by doing something dishonest. As for the importance of choice in character development, Dr. London's advice for individuals who face tough moral or ethical decisions is to "Believe what you're doing; believe that you're doing the right thing. Belief is a core idea -- the way I see it -- not a mechanical process." Dr. London also added, "Success is an internal reward for how you have carried out your life, carried on your business, carried on your life with others. It's more of a personal issue, than it is a material issue; it's not material... it has nothing to do with materiality". In recent times, he has reported on the apparent increase of a "win at any cost mentality". Moreover, he added that previous societal advances weren't based on these types of negative perspectives. Therefore, he's trying to inject his notion of values and doing the right things into societal views. Another important consideration is for individuals to think about the impact of their activities on others -- including unintended consequences. Dr. London wants individuals to recognize that we're in this together and that character sensitivity, appreciation, and respect are necessary for the advancement of our civilization. It's also about driving and developing strong cultures to deliver the very best you can based on high standards, values, integrity, doing the right thing, and trying to do the very best for your clients. At CACI, Dr. London states that there is an ethos and culture to get things resolved as soon as possible, along with an intent and commitment to do things ethically. Dr. London writes in his book, "Achievement can be defined in terms of wealth, power, or fame. Likewise, it can be defined in terms of social welfare and individual fulfillment." This definition of success is different than traditional measurements. Notwithstanding, this additional extension of success is useful to help individuals understand that 'winning' doesn't always have a material representation; instead, success can be achieved by the implementation of moral and ethical beliefs. By helping individual's understand alternative measurements of success, this growing trend of 'winning at any cost' can be reversed or stopped. Dr. London emphasized that a positive attitude is an important character attribute. He states, "The idea of a positive view is a really important one. The sooner you wrap your life with positive perspectives ... the more likely you are to succeed and the happier you'll be. ... It will be a more satisfying experience for people." The important work that Dr. London does to raise individual, organizational, and societal character attributes is commendable. Nonetheless, this mentality must be taught on an ongoing basis in homes, schools, communities, organizations, and other entities. Ultimately, everyone is responsible for their own character development; although, individual choice(s) can have an impact on humanity's character evolution. While making a choice whether to behave morally or ethically, remember that real and impacting success isn't measured by short-term individual gains. Societal success is a partial result of individual actions, but real and lasting success is driven by the cumulation of positive individual characters and choices. My personal takeaway from Dr. London is that character development is a lifelong pursuit. There must be a willingness to admit to mistakes, take a step back, and make a conscience decision to work toward self-improvement. The key message is that it's not about perfection, but something that's being worked toward. Developed character isn't a state or destination, but it's always a personal choice. No financial or other compensation was received for this article. Also, all royalties from the sale of "Character: The Ultimate Success Factor" are donated to Comfort for America's Uniformed Services (CAUSE).